Taaleem is the second-largest group of private international schools in the United Arab Emirates, and Rosamund joined in 2013 as chief executive. Taaleem was founded 15 years ago by local investors and its first four schools opened in 2005. Today it owns and operates 10 premium schools in Dubai and Abu Dhabi. Prior to Taaleem, Rosamund was chief executive of UK nursery schools provider kidsunlimited. 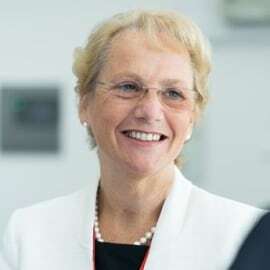 Previously she was chief operating officer at Nord Anglia, managing three divisions: the UK’s largest group of children’s nurseries, learning services contracts for school improvement and school inspection services, and operating and expanding the company’s British international schools in Asia, Eastern Europe and the Middle East. Rosamund has been a trustee of the British Council since 2012, which complements her interests in the promotion of education, arts and society.